When you own a green thumb, your garden becomes a labor of love. Consequently, you stay on alert for ways to keep your veggies, herbs, trees, fruits and flowers healthy and growing. 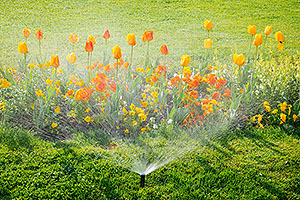 Since seeing the garden sprinkler system Champaign IL neighbors own, you are wondering if you should get one. However, you are not certain about the cost and how it will work. today at 217-398-1494 or contact us online to request more information. Drip Irrigation – Studies have shown conservation of 30 to 50 percent more water than other water systems with properly designed and installed drip systems. Since irrigation is delivered at ground level, it is more easily absorbed. Furthermore, it cuts down on waste and runoff. Spray Sprinklers – This type of system specializes in delivering a high amount of water in a short period of time to specific areas. In order for the best results, clients often upgrade these systems with soil moisture sensors and rain shutoff devices. Rotor Sprinklers – These systems distribute water more evenly and precisely than spray sprinklers. In addition, their adaptability affords more effectiveness in watering uniquely-shaped areas, highly-sloped lawns or turf with soil that does not readily absorb water. When you want the best irrigation, you want Commercial Irrigation & Turf. For more than 30 years, we have delivered on the promise of fast, customized products and service. 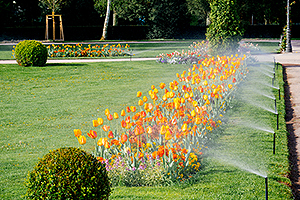 In order to get the garden sprinkler system Champaign IL residents prefer, call us today at 217-398-1494 or contact us online to request more information. Also, you can find us at 206 N Randolph Street in Champaign. Have a job outside of Champaign? No problem. We also serve customers in Peoria, Bloomington, Galesburg, Pekin, Springfield and surrounding areas.